During these past 12 years I've studied every book on writing law documents in a 'plain English' way. Like most people, I don't like the commonly used approach of many attorneys, constantly using 'shall' 'said' etc. when none of that usage is correct according to the experts in legal writing. ​Since I've been a Lexington MA estate attorney for almost two decades, I want to do something about that. And given that I focus exclusively in this area of wills and trusts, my documents and correspondence reflects that deep interest. If you look at other firms' websites, you'll see they list many different areas of law. I have chosen a different, more focused approach. Some people whom seek clarity, thoughtfulness, and simple explanations of this area like our approach, because they frequently ask questions that I can easily and correctly answer. By the way, we don't charge for phone calls for will and trust clients - just give them the knowledge they seek. (Clients really like this). However, because some of our documents have tax provisions, those clauses are not exactly plain or easy to understand. So, maybe 'plainER' better term than 'plain'. These tax provisions are needed in some documents because Massachusetts continues to have an estate tax. And many of our clients own more than $1 million when estimating their estate. Because that includes residence, IRAs, 403(b), life insurance, and other assets. Simply put, there's a need for mathematical formulas in some, but not all, the legal documents. However, apart from these tax provisions, I consciously work to eliminate much of the needless words that make reading legal documents difficult and nearly impossible. And, I find that working in this geographical area that more and more people want to understand how their estate planning works. Particularly those whom live and work in the greater Boston area, such as Lexington, MA where higher educational levels are common. (And the nearby localities of Winchester, Belmont, Waltham, Lincoln, Bedford, Concord, Burlington, Carlisle, Chelmsford, Cambridge, Boston, Somerville, and Watertown, MA). 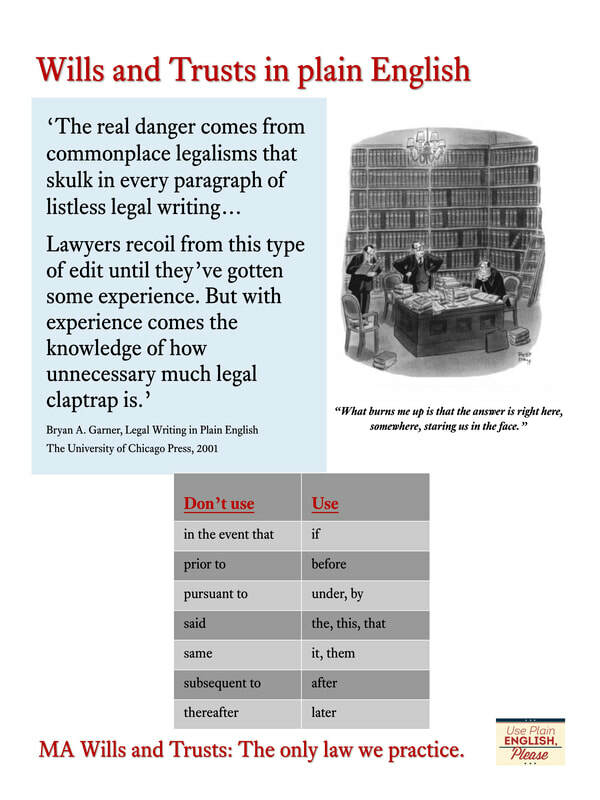 Plain English, not legalese: I've worked to reduce unnecessary words in our documents. Every day when I write letters to clients and other people I work hard to edit, and then edit again, each time to write more directly and simply. You may find the The Economist article on the topic of Plain English to be interesting. The New York Times agreed that Plain English is the preferred approach to law. ​​For example, I've eliminated the words 'said' 'heretofore' and 'herewith'. These words - and similar ones - get in the way when we read. Using them can reduce the effectiveness of our documents. Unfortunately - if reading is more difficult - it's more likely that you just won't read the document. If you don't fully read the document because it is utterly boring and difficult to understand then this can easily lead to not knowing what the document legally does. I (usually) don't use two or three wordswhen one word nicely does the job. I'd rather not use the same word in English and in French, just because lawyers did this in England --- hundreds of years ago. Active, not passive wording: I prefer to write sentences that has a person taking an action, rather than having something happen to the person. I seek to avoid the typical convoluted legal wording. It is not easy and sometimes I fail - but I try not to.